Q: "Hi Protein Chef! It's getting really hot where I live right now, and I am really craving ice cream! 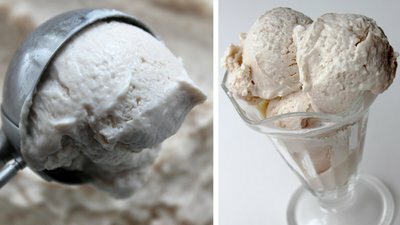 Is there a way to make protein ice cream without using an ice cream machine? Thanks!" I used to think you needed an ice cream maker to make ice cream. I spent years wishing I had an ice cream maker, bookmarking exotic homemade ice cream recipes, and adding ice cream makers to my Amazon.com cart, only to then remove them. After buying a waffle maker and a juicer, I couldn't justify the purchase of another kitchen appliance. One day it dawned on me: I could make ice cream without a machine! I mean, what do ice cream makers do? They churn a cream-based mixture for a long time while cooling it. I thought, "I can do this by churning the mixture myself! By just placing it in the freezer, taking it out to give it a churn, sticking it back in, giving it another churn, and repeating, I'll get an ice-cream-like consistency". So, I tried it. The result? Spectacular! The ice cream was smooth, creamy, cold, and absolutely perfect for a hot summer day. What's also great about protein ice cream is that it's unbelievably easy to make. All you need is time and two—yes, two—ingredients: Greek yogurt and protein powder.